His Holiness Kirill, Patriarch of Moscow and All Russia was on a visit to Greece from June1-7, 2013, at the invitation of His Beatitude Hieronymus, Archbishop of Athens and All Greece, and the Holy Synod of the Orthodox Church of Greece. His Holiness was accompanied by Metropolitan Hilarion of Volokolamsk, head of the Moscow Patriarchate’s department for external church relations, Bishop Sergiy of Solnechnogorsk, head of the Moscow Patriarchate’s administrative secretariat, V. Legoida, head of the synodal information department, Archpriest Nikolay Balashov, DECR vice-chairman, Archpriest Igor Yakimchuk, DECR secretary for inter-Orthodox relations, Protodeacon Vladimir Nazarkin, assistant to the DECR chairman, and M. Kuksov, head of the Patriarchal personal secretariat. Among the Patriarchal party were also Archpriest Andrey Milkin, head of the Patriarchal protocol service, Deacon Alexander Volkov, head of the Patriarchal press service, Rev. Iliya Kosykh, acting secretary of the DECR communication service, and A. Chukyakov, a DECR staff member. Patriarch Kirill was welcomed at the airport in Athens by His Beatitude Archbishop Hieronymus. From the airport the Primates of the Russian and Greek Churches proceeded to the church of the Holy Martyr Dionysius the Areopagite in Kolonaki. In the crowded church, Patriarch Kirill celebrated a thanksgiving. Later that day, the Primates of the two Churches had a talk at the Archbishop’s Palace in Athens. On June 2, Patriarch Kirill and Archbishop Hieronymus celebrated the Divine Liturgy at the church of the Holy Protomartyr and Healer Panteleimon in Athens. Later that day, a reception was given in honour of the high guest by the Synod of the Orthodox Church of Greece. Then the two Primates visited the Russian church of the Holy Trinity and the cathedral church of Our Lady ‘Panagia Soumela’ in Athens. Patriarch Kirill presented the Russian-speaking community of this church with the honorable relics of St. Seraphim of Sarov. During his second day in Athens, Patriarch Kirill visited the Apostoli (Mission) Charity of the Archdiocese of Athens. On June 3, he also visited the residence of the Holy Synod of the Greek Orthodox Church and celebrated a thanksgiving at the Synodal Petraki Monastery. He took part in a solemn meeting of the Holy Synod and addressed it. During the session, His Holiness was presented with the highest award of the Orthodox Church of Greece – the Great Cross of St. Paul. Members of the Patriarchal delegation were also presented with high church awards. Then Patriarch Kirill had a talk with Archbishop Hieronymus and members of the Greek Church’s Holy Synod. Later that day, His Holiness Patriarch Kirill met with Greece’s President K. Papoulias and Prime Minister. A. Samaras. From Athens Patriarch Kirill went to Thessaloniki. He celebrated a thanksgiving at St. Gregory Palamas’s Cathedral there and visited the Metropolitanate of Thessaloniki. In the evening, Metropolitan Anthimos of Thessaloniki gave a reception in honour of His Holiness Patriarch Kirill of Moscow and All Russia. 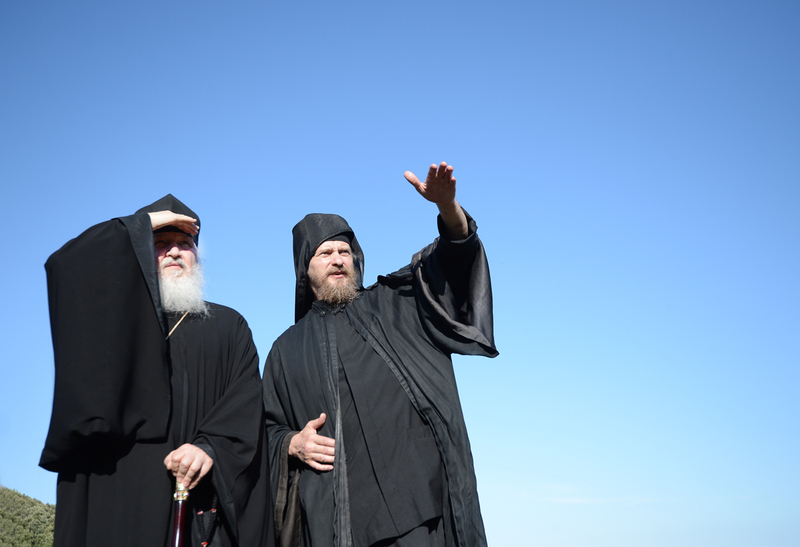 The next day, after venerating shrines in Thessaloniki, Patriarch Kirill went by water to Holy Mount Athos. Upon his arrival there, he went to Karyes, the administrative center of Mount Athos, for a thanksgiving in the Cathedral of Protaton. He also met with the members of the Epistasia of Holy Mount Athos. In the Russian Monastery of St. Panteleimon, Patriarch Kirill venerated its shrines and inspected the monastery buildings restored after a fire. He also said a prayer for the dead brethren of the monastery and visited the place where St. Silouan of Athos performed his feats. On June 5, Patriarch Kirill celebrated the liturgy at the Monastery of St. Panteleimon. During his pilgrimage to Athos, Patriarch Kirill visited the Great Laura of St. Athanasius of Athos, monasteries Iveron and Pantocrator, the hermitage of the Prophet Elijah founded by St. Paisius Velichkovsky, monasteries Zograf, Hilandar, Vatopedi, Xilourgou Skete, and the Hermitage of St. Andrew, and inspected the restoration work at the Old Roussik monastery. On June 7, His Holiness celebrated the Divine Liturgy at the church of the Protecting Veil in St. Panteleimon’s Monastery. After the service, he had a talk with mass media reporters. In conclusion of his pilgrimage to Mount Athos, His Holiness Kirill addressed himself to the brethren of the St. Panteleimon Monastery with an instruction and had a talk with the abbot, Archimandrite Jeremiah. 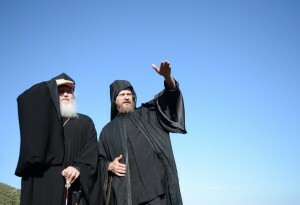 At the town of Veria, Patriarch Kirill opened a monument to St. Paul. In the Panagia monastery, he blessed the bells for the church of St. Luke (Voino-Yasnetsky) under construction. In conclusion of his visit, Patriarch Kirill shared impressions of his pilgrimage to Greece with journalists.